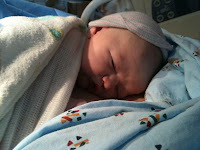 Well, he took his time about it, but our baby boy arrived on Monday, May 17th just 10 days behind schedule. I went in for a dreaded scheduled induction and, deciding he would not be bullied into anything, our kiddo opted to come out on his own without undo prodding as I sat waiting for my pitocin delivery. While hearing my husband describe the delivery as "really easy" made me threaten him alternately with great bodily harm and divorce, the fact of the matter was it really wasn't too bad. Turns out that 350 years of Irish peasant folk breeding with each other has resulted in me - - the 3-hour laboring super birther! Baby is currently going by the name "Crinkles McWrinkles", but I'm sure that will evolve over time. I'd write more but I fear for what might emerge from my advanced state of sleep deprivation. Suffice it to say that Crinkles is doing swell and mama is crabby, tired, sore and wildly elated.